The long awaited summer holiday is just some weeks away and primary & secondary school children in Nigeria will have approximately a month and a week to ease themselves off class work and home work. Decades past, holiday has always been a time when children visit grandparents in their home town or take a trip to spend time with their loved ones abroad. It is also a time school children take a break from the daily 8am – 2pm lecture hours in school and the task to meet up with class work and home work. It is widely accepted that not all is taught in the classroom. 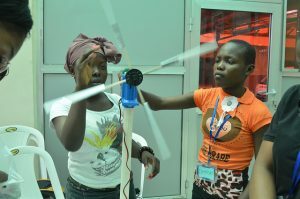 It is however necessary for parents to ensure they locate a summer camp near them and enroll their kids to learn hands-on practical skills in STEM and renewable energy. With this, the country will have future problem solvers and innovators. To this end, WAAW Foundation presents list of Summer STEM camps that engages children and secondary school students in STEM education during the summer holiday. The 3-week STEM and Computer science training workshop is a special workshop designed for boys and girls between the ages of 13-17 years to gain practical experience in introductory programming language using Java, website construction, games, basic design techniques, renewable energy and so much more. Venue: 39/41 Osolo way, off International Airport road, Isolo, Lagos, Nigeria. Students Ages 8 – 17 will be exposed to Mobile Games Design & Programming; Electronics Circuits Design & Programming; 3D Animation; TV Production; Web Design & Programming; and Drone Progamming etc. 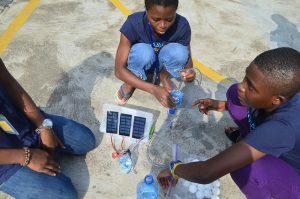 Activities include: coding, building of solar panel and windmill, basic computer programming, animation, digital photography, digital video production, app development, blogging and lots more. Date: August 1st – 27th 2017. Camp Venue: Impact High School, Adebayo Unuigbe Close, Alagbaka, G.R.A., Akure, Ondo State, Nigeria. The Women’s Technology Empowerment Centre- W.TEC invites aspiring young girls from all over to the country to the 10th W.TEC Girls Technology Summer Camp tagged ‘Girls Build Tech’. This camp provides an integrated learning approach, which centres on guiding the girls to explore information and communication technology (ICTs) that can be used to solve significant problems in their communities. The Summer of Code is a 4 week, interactive programme to introduce kids aged 5 – 18 years old to Computer Science and programming. At the Summer of Code kids learn to make connections between technology and their interests; as they learn how to design computer games and animations using Scratch, design web pages using HTML/CSS and build computer applications using Python. Bricks4Kidz summer camps provide one example of active learning opportunities where hands-on model building allows for math and engineering practice.